Over the last few years the Embassy of Sweden has organized a series of seminars dedicated to innovations and R&D. At these events Swedish and Hungarian experts and decision-makers from the public and private sector had the opportunity to learn and share experience through presentations and round table discussions. The keynote speakers at these events have ranged from young inventors and startup stars to state secretaries and foreign ministers. This year not only invited speakers, but the whole audience was involved in discussions and experience sharing. All attendees had the opportunity to take part in collaborative conversations, and voice their ideas and perspectives in an interactive and informal way during high-level workshops. The underlying concept behind the Innovation Ecosystem Café is the “World Café” methodology, a laboratory for meaningful dialogue in groups of all kinds. Experts have discussions in small groups by answering supporting questions and sharing ideas and insights on how to develop the innovation ecosystem together. 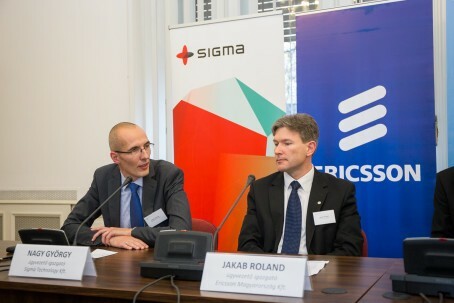 “Sigma is one of the founding members of the Swedish-Hungarian Innovation Forum. For the last years together with our partners we have managed to transform a good idea into a series of regular events where participants from like-minded corporations and government organizations have an opportunity to discuss the state of innovation, both as it develops in their companies, and also on national and international levels. The format of the event is regularly updated from small seminars to bigger conferences,” says György Nagy, Country Manager at Sigma Technology Hungary. Together with his colleagues from Sigma Technology Hungary, János Turóczi, Software Team Leader, and Dóra Cseresnyés, Unit Manager, György attended the event to discuss the innovation ecosystem development and contribute with what Sigma Technology Hungary does to nourish innovation.